I presented a story about Urushi in the past. This time I’ll continue the story. 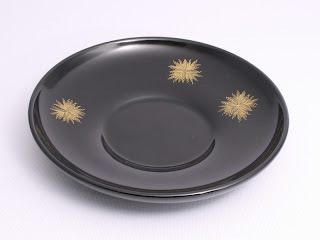 Urushi comes from tree sap. When the trunk of the tree is cut, it produces a resin to try to repair the cut area. It is like a rubber tree. This resin is urushi. Because the resin can cause a rash if it touches the skin, it was commonly believed that urushi had special powers to ward off evil. A single tree can only produce a few grams of resin each time it is tapped. Urushiware must be painted with many coats until the beautiful shining color appears. So, this sap is quite valuable due to its limited quantity. That is the reason urushiware is expensive. Black and red colors are famous in urushi, because, the red is connected to Japanese custom. In ancient times, red was believed to be an auspicious color that kept away evil spirits and brought good luck. Urushi is called Japanese lacquer in English. In the 17th century, urushiware was shipped to Europe. Europeans felt it was very graceful tableware. They held it in such esteem that it was called ‘japan’, as people call beautiful potteries, ‘fine china’. Is an urishi a lacquered ceramic or is it some distinct kind of Japanese craft? I am really interested in Japanese art and crafts and have in fact learned a few basics. Thank you.